When you sell your shares for cash, you’re responsible for the tax due on the gain, even if you plan to donate the proceeds from the sale. If you pay the tax out of those proceeds, there’s less money left to donate. Your charity receives a smaller donation and you have a smaller donation to claim for your charitable tax credit at the end of the year. 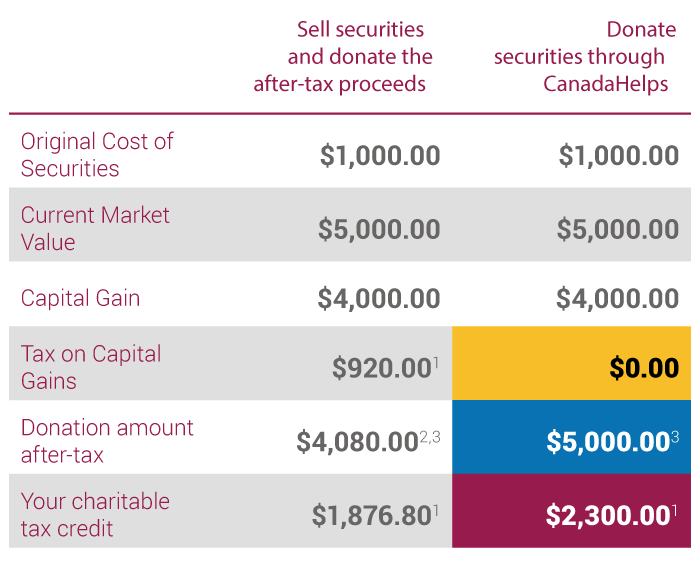 But when you donate your securities directly through CanadaHelps, those capital gains aren’t subject to tax. This means your charity receives a larger gift, and you’ll benefit from a tax receipt for the full value of your eligible securities or mutual funds. Let’s say you purchased common shares in ABC Company for a cost of $1,000. If the current market value of those shares has increased to $5,000, you would have a capital gain of $4,000. If you sell those shares and donate the cash proceeds, you’ll owe tax on the capital gain. So, you set aside the taxes due from the proceeds, leaving you with less than the full cash value to donate and a tax receipt which reflects the smaller donation. But when you donate the shares directly, you owe no capital gains tax and you’re able to donate the full value. So your charity gets a larger donation and you get a tax receipt which reflects your larger contribution. In this illustration, you’re able to donate the full value of your securities to charity: $5,000.00. Your tax credit on that amount would be approximately $2,300, or about $920 more than if you had sold the shares and donated the proceeds as cash. By donating shares directly, you can save on taxes while you’re offering more help to the charities you care about most. 1. This assumes a 46% marginal tax rate. For calculating capital gains tax, this rate is applied to 50% of the capital gain. 2. $4,080.00 represents the full value of $5,000.00 minus estimated tax of $920.00. These are general figures for the purpose of illustration. They do not constitute legal or financial advice. We strongly encourage you to seek professional legal and/or financial advice before deciding upon your donation to charity.